Cook Memorial Library does it again! 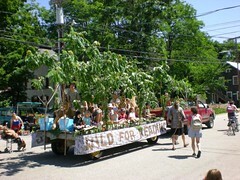 The summer reading program’s theme is “G’day for Reading” with an Australian flair. 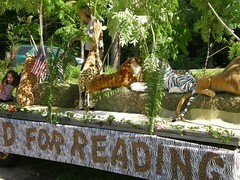 So in that spirit the float’s theme “Wild for Reading” was born. 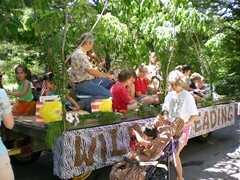 Amy Carter, Children’s Librarian extraordinaire, led a team of people to victory – first prize for “Best Civic Float.” Here you see everyone assembled, animals and children, with Taylor Whiteside serenading the crowd on the violin.